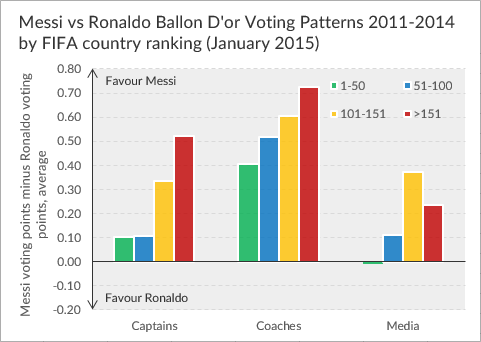 In the previous post, we established that there is a distinct Europe-Americas divide when it comes to Ronaldo-Messi preferences, according to Ballon D’or voting choices. Regardless of your role, if you’re from the Americas you tend to be a Messi supporter (at least if you’ve been a Ballon D’or voter). Curiously, coaches also tend to have preferred Messi, generally more so than captains and media; the reasons (if any) are up for debate, but perhaps coaches feel the Argentine would be the ‘perfect’ player to manage. Another interesting relationship exists between the quality of teams and their voting preferences. As a rule of thumb, if you represent a stronger national team, you are less inclined to vote for Messi than if you were from a weaker nation. There may be an underlying bias that causes this relationship – namely that European teams occupy many of the highest places in the FIFA rankings, and, as we have seen, have voted slightly in favour of Ronaldo, in general. 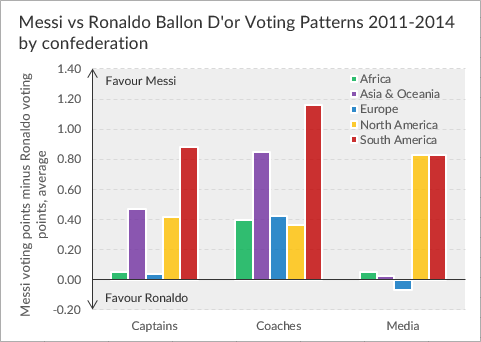 There is also a time factor to consider in all these analyses; in 2011 and 2012 Messi was the clear favourite, whilst in 2013 and 2014 Ronaldo was the frontrunner. In no vote has it been ‘too close to call’ – otherwise we might have an even truer reflection of the Messi-Ronaldo divide. Love this site, its by far one of my favourites. One suggestion though, is to use images or infographics when comparing players, teams etc. just so it’s easier to visualise and not so long winded. I think sporticos.com do ones that you can download and look pretty cool.